Another year to raise money for an amazing cause. This event is a not to be missed in Philadelphia, PA more than 40 of the world’s greatest chefs will convene in the ninth annual Great Chefs Event, hosted by James Beard award winner Marc Vetri, restaurateur Jeff Benjamin, and James Beard award winner Jeff Michaud. 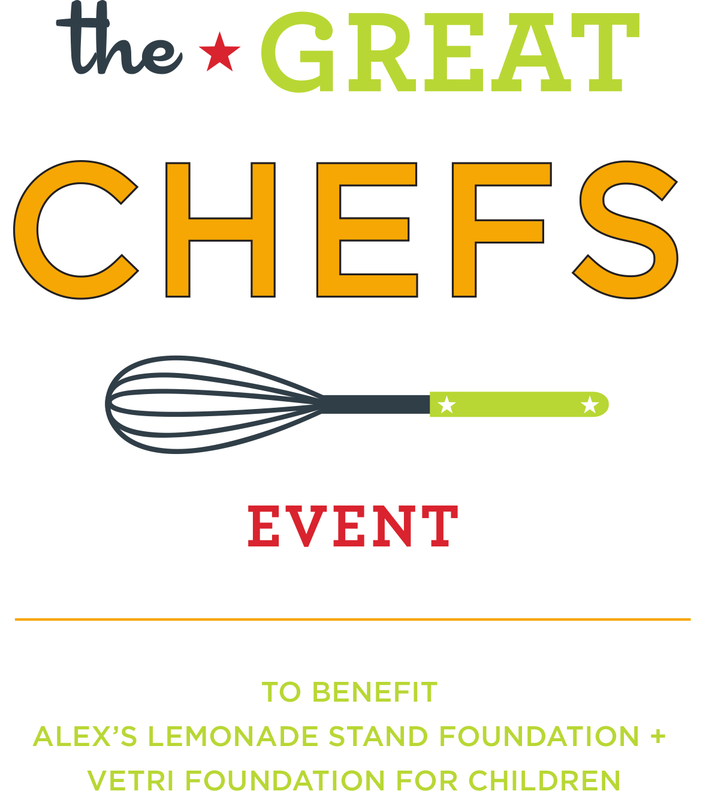 The event will benefit Alex’s Lemonade Stand Foundation and The Vetri Foundation for Children. More than 1,200 guests will gather at Urban Outfitters World Headquarters on Philadelphia’s waterfront Navy Yard for the foodie charity event of the year, with an exclusive VIP after party at Alla Spina for sponsors and VIP ticketholders. Marc Vetri has hand-selected the list of participating chefs, calling on his renowned chef friends from around the world, top talent from LA to NYC, Chicago to Italy. The chefs will donate their time, talent, and food, creating delicious samplings for guests in the walk-around tasting gala of the year. In addition to fine food, representatives from the best distilleries, wineries, craft breweries, will also be present, including Greg Lindgren from Rye in San Francisco, Tim Staehling of The Hungry Cat in Los Angeles and more (Please see a complete list of beverage participants below). Guests will enjoy an evening of music and mingling, as well as silent and live auction items, all in the name of charity. Auction items include one-of-kind experiences such as participating chefs preparing private dinners at home and a guided tour through Belgium with stops at museums, breweries, historic bars, shops, Michelin starred restaurants, led by award-winning beer expert Tom Peters (Monk’s Café). Ten years ago, Marc Vetri and Jeff Benjamin met Liz and Jay Scott, who were carrying on the work that their amazing daughter Alex had started, to help find a cure for all kids with cancer. They were moved by Alex’s story, and by the perseverance with which Liz and Jay honored her vision. As many do, they walked away from that conversation asking, “What can we do to help?” Their answer was to host the first Great Chefs Event, which brought eight local chefs and 100 guests to The Restaurant School at Walnut Hill College, raising $50,000.00. “The event has grown beyond belief from 100 guests to more than 1,000; from $50,000 in donations to more than $1 million; from eight chefs to 40 and the event has even expanded beyond Philadelphia with chefs taking the concept to LA and New York,” said Liz Scott, Alex’s mom and co-executive director of Alex’s Lemonade Stand Foundation. Vetri and Benjamin, meanwhile, inspired by the impact of their efforts, founded Vetri Foundation for Children in 2008 to give back in the area they know most about— healthy food and nutrition for Philadelphia’s youth. This year’s event benefits both organizations. This year, the after-party will be held at Alla Spina, a Vetri family restaurant. VIP ticketholders and sponsors of the event will have the exclusive opportunity to rub elbows with all of the talented chefs in an intimate setting. The late night after-party shuts down the block and promises live entertainment, music, food, drinks, celebrity guests and a convivial atmosphere. Guests can expect barbecue from Chef Adam Perry Lang, additional bites from Vetri Family chefs, cocktails, and the complete insider industry experience.